If you know Tom Galley's Phenomena project, then there's little to explain about the breadth and depth of it's caliber. You get it. There's nearly 30 years of musical history here, and it's all good: classic melodic hard rock with a metal edge. Resurrected only recently, six years ago, Galley works with the same formula: gather the best vocalists and musicians from the UK and European theater, and then give them world class melodic rock/metal songs to present. The result is obvious. You can expect the good stuff, and Awakening delivers. Earlier Phenomena albums had a conceptual theme, but Awakening does not. There's simply ten strong melodic hard rock songs. Some turn on a heavier more metal side like How Long and Shake. Interestingly, Ralf Scheepers, a notable metal singer, gets the more groove rock of Gotta Move. Rather than sounding out of his element, he's sounds terrific. For more rock groove, and a catchy arena sound, Fighter entertains with Terry Brock on mic. The lightest piece here, and perhaps the most curious, is If You Believe with Chris Antblad and the JAVA Gospel Choir. While it doesn't quite have the power of something like Foreigner's I Want to Know What Love Is, it is inspiring. 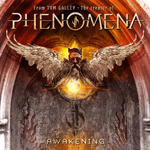 According to the Phenomena web site, Awakening is to be the last album featuring the Tom Galley branding. What the future holds is unclear. Until then get yourself a copy of the latest. Very recommended. Phenomena's Awakening offers another installment of fine melodic hard rock performed by many great singers and musicians from the pan-European theater.